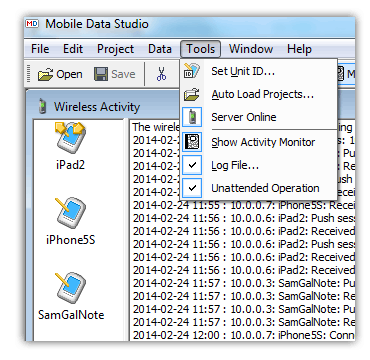 Mobile Data Studio (MDS) version 7.3.2.1 precedes current Mobile Data Studio 8.0 of 12 October 2015. Windows XP can run Mobile Data Studio 7.3.2.1 but not Mobile Data Studio 8.0. Windows XP users can download Mobile Data Studio 7.3.2.1 software but must have an Mobile Data Studio licence to operate beyond 15 days. 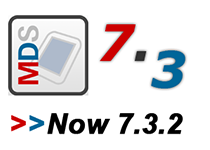 See some features of MDS 7.3 below. 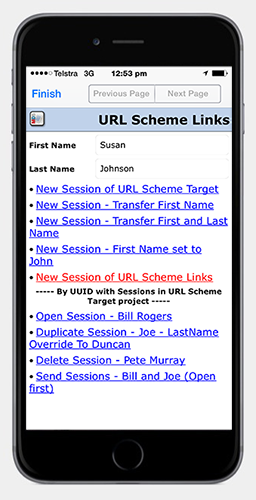 URL SCHEMES TO LINK PARENT AND CHILD PROJECTS: Mobile Data Studio version 7.3.2 adds a powerful function to build on URL Schemes to enable a Parent to open Child projects and set up a return path to the specific originating session in the Parent project. 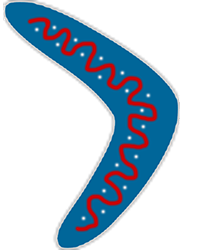 A 'Boomerang' function! This enables a Parent project to potentially run multiple Child projects linked via the Link point using the powerful 'URL Schemes' introduced in previous version 7.3.1. This is made possible by a change to expose the session GUID (UUID) at session creation time on the mobile client, and a change to the URL Schemes to enable the session GUID to be adopted. The session GUID can be exposed using <%_GUID%> as default in the Edit point, in the Layout point, and in URL Schemes. In conjunction with the new Parent to Child path, URL Schemes can dynamically transfer data between projects. Download demonstration Parent and Child projects to examine the URLs in the Link points and test out the 'Boomerang' effect. (Note: there should be no space in Project .ppc file names when using URLs.) Please see more information on this URL Scheme function in description of the Link point . NOTE: AUTO-UPGRADE OF ANDROID AND WINDOWS MOBILE CLIENT DEVICES: To auto-upgrade connecting client devices via TCP/IP wireless enable 'Offer Mobile Data Studio upgrades' in Wireless Options (via Tools > Server Online). For Android devices this will upgrade Mobile Data versions 7.3.0 and 7.3.1 to 7.3.2; the function doesn't apply to version 7.2 Android clients. NOTE: The functions in this upgrade are applicable to Mobile Data for Android and Apple iOS; not to Mobile Data for Windows Mobile. Windows Mobile users should continue with Mobile Data Studio version 7.3.1. URL SCHEMES TO LINK PROJECTS: Mobile Data Studio can run multiple projects which can now be linked via the Link point using powerful 'URL Schemes'. The new URL Schemes can dynamically transfer data between projects, open a session of the same project from within a session and execute functions for specific sessions identified by the session GUID (UUID). URL Scheme Examples are available to assist setting up URL Schemes for projects, by download of Zip from this web site or access to Zip in Dropbox. Please note the details of Schemes in the provided documentation, including important difference in operation in Android and Apple iOS.There should be no space in Project .ppc file names when using URLs. SESSION LIST COLUMNS: consistent default Time and Date between Android and iOS and optional retention of Time and Date. To retain Date and Time after selecting data points for Session List Columns in Project > Properties > Options, add _TIME and _DATE to add to Session List Columns. Session List Columns can now also display by point Caption in Apple iOS, consistent with Android. ULTRADROP POINT: ‘Include empty item’ extended to filtered, dynamic data, filtered dynamic data and shared data in Android and Apple iOS. OTHER CHANGES: Duplication of session in Apple iOS now also opens the new session, consistent with Android. Purge control of sent and deleted sessions in Android extended out to 100 days, consistent with Apple iOS. Export to Excel in Vertical mode enables XLSX files to extend to greater than 255 columns. Fixed ommission in Android that allowed ‘Auto-submit’ of sessions to override Validation option. 'Delete All' sessions in Session Folders limited to specific folder. Latest Apple iOS 8 compatible, and backwards compatible; Mobile Data on iPhone 6 Plus shown on the right. NOTE AUTO-UPGRADE OF ANDROID AND WINDOWS MOBILE CLIENT DEVICES: To auto-upgrade connecting client devices via TCP/IP wireless enable 'Offer Mobile Data Studio upgrades' in Wireless Options (via Tools > Server Online). For Android devices this will upgrade Mobile Data version 7.3.0 to 7.3.1; the function doesn't apply to version 7.2 Android clients. Take advantage of new features in Mobile Data Studio with free upgrade to version 7.3 for licence holders at Customer Login (download MobileDataStudioSetup.exe and MobileData.apk) and at Apple App Store. Improvements for the design and function of powerful projects for Android Smartphones and Tablets, Apple iPhone and iPad, and Windows Mobile devices. See some features of upgrade below, and review the Mobile Data Studio Skills tutorial for detail. Please note, there is no change to the project file format since version 7.2.0. All 7.2 projects are compatible with new version 7.3.0. SESSION LIST COLUMNS: Sessions on iPhone and iPad are now organised in 'Session List Columns', as for Android and Windows Mobile devices. Data in a particular column can be sorted alphanumerically by tap to the top of the column and the header for the active column will be blue. See example on right. 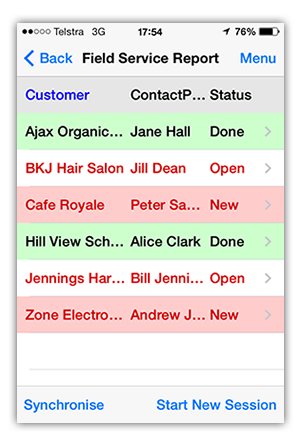 The columns can be re-sized from default by dragging the header; change of orientation from portrait to landscape (and vice versa) will reset columns to default. Session List Columns are essential to track sessions on mobile devices and are set in project Design mode via Project > Properties > Options. VALIDATE SESSION DATA BEFORE SEND: A new control which only allows a session to be sent to the Mobile Data Studio server when a specific point contains specified data. Session Validation is set in project Design mode via Project > Properties > Advanced. The specified validation point must be included in Session List Columns. To test a session Validation example, download Field Service Report project modified for session Validation (on the 'Report' page). CONFIGURE WIRELESS SETTINGS BY URL: The Server Address, Port,, Password, UnitID, Session managment and a Lock of the Settings page can all be set via a URL sent to a mobile device via either email or SMS. Download an example 'Configure mobile device Settings via URL'; and modify for your Settings requirements. Note, the explicit details of Settings in the example would not normally be sent to users, only the URL. The Settings page has two additional controls to 'Lock the settings page' and 'Prevent session duplication'. Note, to un-lock the Settings page the TCP/IP Access Password must be entered. ULTRADROP POINT: The default operation of the UltraDrop point has a 'Search' function to search the Display column data. There are three new UltraDrop functions set in project Design mode: the point can now dynamically display and manage data sourced from Edit and Formatter points; data received from text files and updated via Wireless can be sorted alphanumerically; and a blank item can be included to clear value in single selection (of un-filtered data). OTHER: Temporary save of data when changing pages, saving image, going to other programs and background. Presents iOS 7 style. 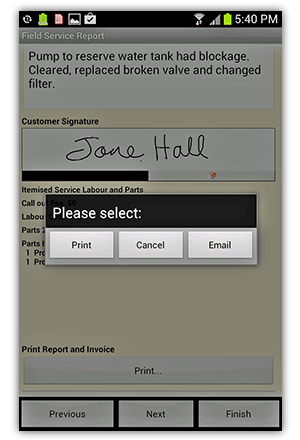 PRINT POINT: In addition to printing a HTML report via a mobile printer, the Print point now presents an option to 'Email' the HTML report using a choice of available programs for email. Please note that any image files will be attached to the email along with the HTML; saving to the same folder on the recipients computer will display the images in the report (eg a signature image from Sketch point). The HTML report and any images can also be placed in Dropbox if that program is installed. To test email of HTML and a signature image, download Field Service Report ; please note a 'Customer' and 'Contact Person' should be entered on the 'Customer page'; accessed via > details on the 'Job' page. AUTO-UPGRADE MOBILE CLIENTS: Mobile Data for Android 7.3.0 enables an auto-upgrade of remote Android devices with the NEXT upgrade to Mobile Data for Android (eg 7.3.1). To auto-upgrade remote Android devices, on the Mobile Data Studio server side in 'Wireless Options' (via Tools > Server Online) enable 'Offer Mobile Data Studio upgrades'. To enable auto-upgrade, the current version of MobileData.apk will be in the MobileSetup directory of Mobile Data Studio when installed in Windows. VALIDATE SESSION DATA BEFORE SEND: See same item for Apple iOS Mobile Data clients above. 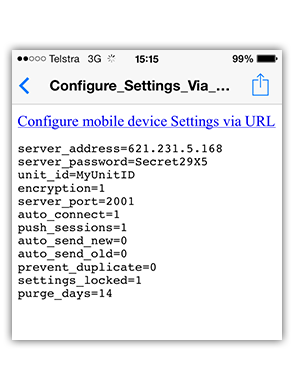 CONFIGURE WIRELESS SETTINGS BY URL: See same item for Apple iOS Mobile Data clients above. Note the addition to Settings of controls to 'Lock the settings page' and 'Prevent session duplication'. ULTRADROP POINT: See same item for Apple iOS Mobile Data clients above. LOCAL LANGUAGE CHARACTERS: See same item for Apple iOS Mobile Data clients above. LOCAL LANGUAGE CHARACTERS: The Design and other functions of Mobile Data Studio on the Windows server side have been fully converted to Unicode (see Data Format below) to enable support for all language characters in Design of projects. This includes Chinese, Arabic and Cyrillic characters; we welcome project developers worldwide to use local language characters. UNATTENDED OPERATION: A new control in Tools for 'Unattended Operation' optimises the Mobile Data Studio server for operation without direct supervision. In 'Unattended' mode any 'pop ups' or other messages are suppressed so there is no impediment to communications and flow of session data; messages are written to text Log file and Activity Monitor. DATABASE SCHEMA: To assist alignment of new database field names and limits with project point ID Names, a CSV schema can now be generated. With a project open, this function is accessed via File > Export > 'Export point names to CSV'. Where there is no 'Limit' for a string or number for a point it is shown as -1. CONFIGURE WIRELESS SETTINGS BY URL: See same item for Apple iOS Mobile Data clients above. ADVANCED FUNCTIONS FOR PROGRAMMERS: New COM objects, scripts and protocols have been included in the Data Script functions of Mobile Data Studio which can be applied in Data management. These advanced functions enable programmers to customise automation of processes; download details of the new COM objects, scripts and protocols. Any issues arising during deployment of Mobile Data Studio version 7.3.0 will be advised here. Camera point operation on iPad in iOS 7: When operated in landscape orientation, the live preview of subject may be sideways; the captured image is correctly oriented in landscape.This limitation does not affect the image data function of the Camera point on iPads in iOS 7. If possible, this will be resolved in future upgrades. Please NOTE: there is no change to the project file format since version 7.2.0. All 7.2 projects are compatible with new version 7.3.0. However, any version 7.1 mobile clients should be upgraded to version 7.3.0. Note: The 'Encoding' option in Notepad -> File -> Save As, allows selecting character set encoding when saving a text file.